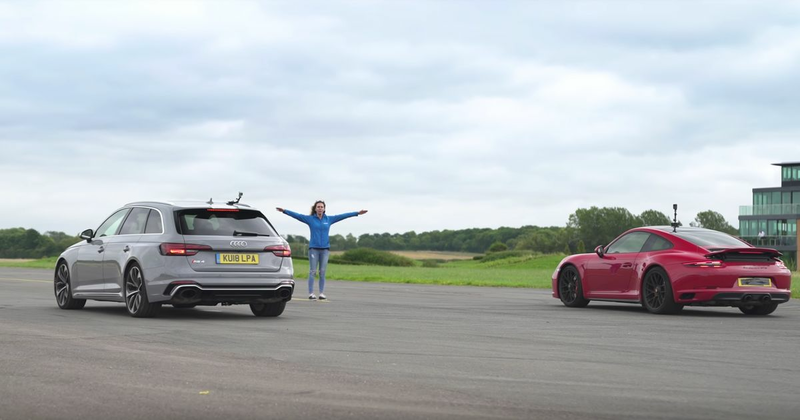 While initially looking like an odd pairing, the presence of an Audi RS4 and a Porsche 911 GTS on one drag strip makes more sense than you might think. Both are powered by six-cylinder engines producing 444bhp, and each has an automatic gearbox, albeit with the Porsche using a dual-clutch transmission and the Audi opting for a more traditional torque converter-based unit. The 911 has a substantial weight advantage over the much bulkier RS4, but on the other hand, the latter car has all-wheel drive. Since we’re looking at a rear-wheel drive GTS here (an all-wheel drive version is available) which might not get off the line so well, this has the makings of a very evenly-matched battle. Sure enough, the standing-start race is extremely close. We don’t want to spoil the ending, so hit the play button to see which comes out on top!